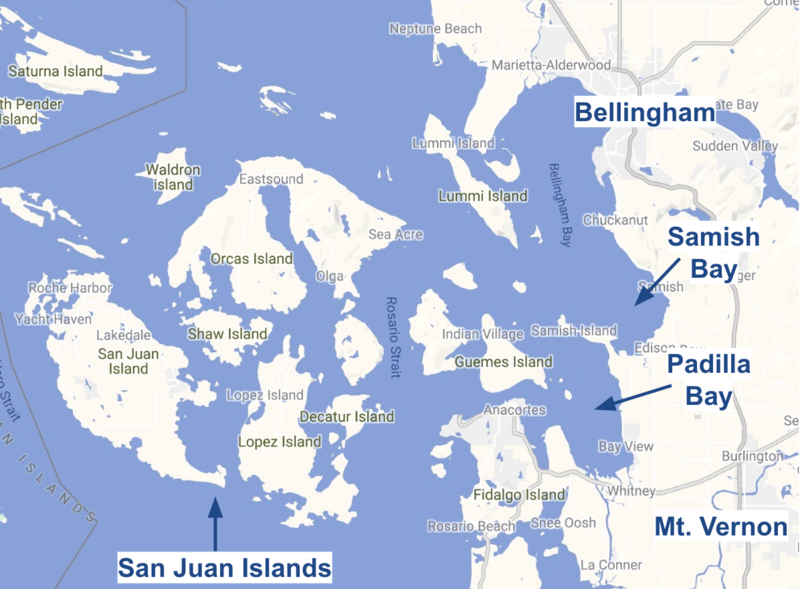 Samish Bay is located just northeast of Padilla Bay. 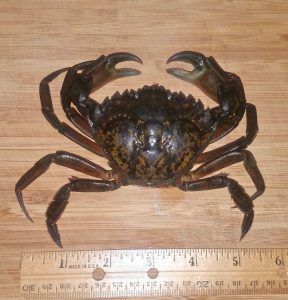 Three European green crab have been found in Samish Bay, north of Mt. Vernon, a new detection location for the globally-damaging invasive on Washington’s inland shorelines. The three adult crabs, including an egg-bearing (gravid) female and two males, were captured by shellfish growers working for Taylor Shellfish Farms on three successive nights in early January. 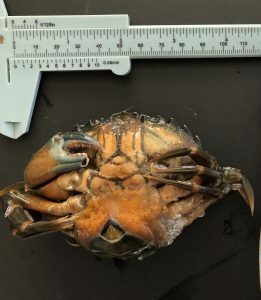 The growers recognized the crabs as invasive while handling oysters and sorting out other animals, and quickly reported them to Washington Department of Fish and Wildlife and WSG Crab Team. In the context of the recent expansion of green crab into Washington’s inland shorelines, these captures are notable for several reasons. Not only are these detections the first in this water body, but this is also the first time green crab have been found during the winter months. When it gets cold, green crab tend to migrate from intertidal shorelines to slightly deeper waters, because water temperatures in this region don’t drop as low as air temperatures. In the muddy habitats green crab like, this often means they are moving into areas that are good for growing shellfish as well. It might be cold, windy and dark during winter low tides, but shellfish growers are out on the mud taking care of the oysters and clams that we like to eat. As they handle shellfish and sort through bags, they see a lot of other animals as well. This means that, in the winter, shellfish growers are often the best early detection crew possible. They are able to work in places where green crab are likely to be found but which are difficult to monitor otherwise; they are keeping a close eye on every animal they see; and they have a lot of experience looking at native crabs, meaning they are unlikely to miss even a rare crab that looks “different”. These detections also mark the first time an egg-bearing female has been found as a part of the recent range expansion into Washington’s portion of the Salish Sea. Each female can produce hundreds of thousands of eggs per brood, and multiple broods per year, so capturing this female before she released her eggs certainly reduced the number of larvae that could spread to other local habitats. Even though it is important to remove egg-bearing females from the environment, it is very difficult to trap for them. To begin with, as a baseline, males enter baited traps more frequently than females – so far at a rate of about two males for every female. When females are carrying eggs, they are even more reluctant to risk climbing into a trap. They usually find a protected place to hunker down until they release their eggs. Though extremely labor intensive, searching for gravid females by hand is more likely to catch them than trapping. The three crabs were removed from the tideflats and provided to Crab Team staff for biological sampling. DNA and other samples from these crabs will help us continue to learn how green crab are moving around the Salish Sea and what impact they could be having. Shellfish growers in Washington’s coastal embayments, Willapa Bay and Grays Harbor, have been aware of green crab for the past three decades. But, to date, green crab in those locations have only been common enough to be noticeable every few years, and haven’t been sufficiently abundant to cause substantial damage to shellfish harvests. The past few years, during which our region experienced very warm winters favorable to green crab, could mark a possible change in that pattern. A few lines of evidence support this possibility: (1) Crab Team’s has observed green crab expanding into Washington’s inland shorelines from the coast, (2) more green crab have been found in coastal bays in Oregon and Washington in recent years; and (3) a new population was detected in Makah Bay in late 2017. It’s also possible that, because of the size and complexity of the Salish Sea compared to small coastal estuaries, an inland invasion by green crab could be more problematic than one on the coast, growing a population faster than has been the case to date in Willapa Bay and Grays Harbor. Ongoing monitoring work is critical to help us learn more over the next few years about the influence of environmental and climate conditions on the spread of invasive green crab in our region, even as we focus on prevention and control. On the US East Coast, shellfish harvests have been substantially harmed by abundant European green crab, but there’s still some uncertainty about whether commercial shellfish growers here in Washington would face the same risk. It’s a little like comparing apples to oranges, or in this case, hard clams to softshells. Moreover, many shellfish grown for market in this region are protected from predation by native crabs in ways that could also help protect them from European green crab. Wild shellfish, however, including those available for recreational harvest, and which make up the majority of tribal harvest, would still likely be vulnerable to being eaten by green crab if this invasive predator becomes abundant. To date, however, populations remain low and our region has avoided many of the negative impacts documented elsewhere. With luck, and help from our committed volunteers and collaborators, we hope to keep it that way. Header photo by Emily Grason.